Many people believe that eating healthy means that they will have to switch to eating “rabbit food” and that they will have to give up all of their favorite comfort foods like Mac and Cheese, Spaghetti and Meatballs, or Chicken Parmesan. I recently received the latest Cooking Light magazine in the mail that shows a delicious looking Chicken Parmesan recipe on the cover and I realized both that I had never shared my own lightened up Chicken Parmesan recipe, and that I also had not made this dish for a long time! 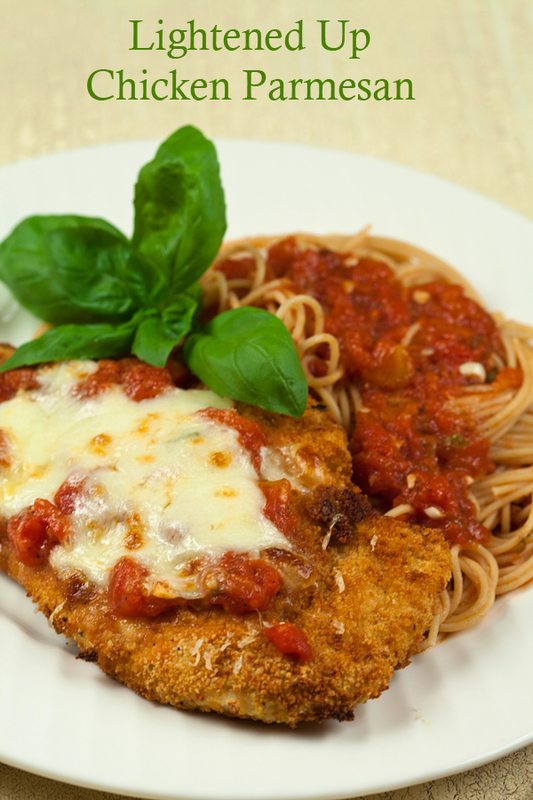 Chicken Parm is a favorite of my Son-In-Law and my grandkids, so almost every time I visit them in Michigan I make this dish for them. Though thought to be a traditional Italian dish, it is actually an Italian American one, and I personally have never seen it on a menu anywhere in Italy though it is indeed loved by many on this side of the ocean. This dish is frequently on many Italian restaurants here in the US, but the portions served are usually extremely huge packing lots of calories and fat into every bite. The chicken is usually fried in butter and oil and then topped with heaps of cheese and each dish is served alogside a portion of spaghetti that could (or should) feed a family of four. Certainly not a “light” dish by anyone’s standards! You can however make this dish healthier with just a few tweaks so that you can it enjoy it if you are trying to eat healthier in 2014, or even if you are wanting to shed a few pounds. Most chicken breasts sold today are between 6 to 8 ounces if not more. By slicing the chicken breasts horizontally to create two cutlets, you can easily feed four from just two chicken breasts. Once the breasts are breaded and cooked, 4 to 6 ounces is really plenty, especially when served with a side of whole wheat pasta. I always bake my breaded chicken cutlets instead of frying them, and find olive oil spray works really well to keep the added fat to a minimum. When slicing the chicken breasts, it is best completed if the breasts are partially frozen. To help, you can also bread the cutlets and prepare the sauce ahead of time to help speed up your dinner time prep if you prefer. A couple of other tweaks help to make this a healthier recipe……replace regular spaghetti with a whole wheat brand and keep this portion small as well. Include a vegetable side to fill up the plate such as sautéed spinach or roasted broccoli. Switch from full fat cheese to partially skimmed cheese, and don’t overdo the cheese. A little melted cheese goes a long way! The portions of both the chicken and pasta are kept appropriate to prevent overindulging. 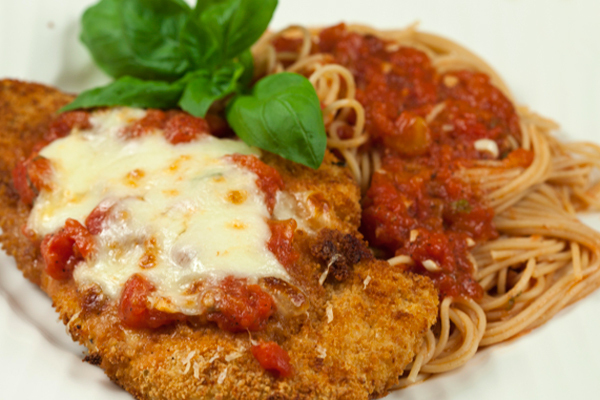 The chicken is baked instead of fried, and whole wheat spaghetti is used in place of regular. Partly skimmed mozzarella is used in place of full fat. With a sharp knife, cut the two breasts horizontally down the middle creating 4 cutlets. Use a meat mallet to lightly pound the breasts to ensure they cook evenly. Dredge the breasts in the seasoned flour, then in the beaten egg, then finally into the seasoned breadcrumbs. Once all 4 cutlets are breaded, store them in the refrigerator until needed to help the crumbs to adhere to the meat. Heat the oil in a saucepan over medium heat and once lightly smoking, cook the garlic a minute or two until fragrant. Add the tomatoes, oregano, pepper flakes, and basil and mix well. Bring the sauce to a boil, then reduce the heat to a simmer and cook 10 minutes. Preheat the oven to 400 degrees F. and set a large pot of lightly salted water on to boil. Spray a foil lined baking sheet with the olive oil spray then lay the cutlets on top. Lightly spray the top of the cutlets and then bake 10 minutes. Turn the cutlets, and bake about another 8 minutes or until cooked through. While the chicken is cooking, put the pasta in the boiling water and cook according to package instructions until it is “al dente”. Drain the pasta and mix with half the sauce. Spoon some of the remaining sauce on top of each of the cutlets, then sprinkle evenly with the two cheeses. Broil for a minute or two until the cheese has melted. Serve the chicken alongside the pasta with a spoonful of additional sauce if desired.